The December 14th, 1904 edition of the Cottage Grove Sentinel had this charming article about a dance at the Kerr home in Wildwood. Home of George Kerr near Wildwood on Friday Night a Scene of Enjoyment That not all the good times are experienced in towns is evidenced by the social gathering at the home of Mr. and Mrs. George Kerr near Wildwood on last Friday night. Their son and daughter, George and Mrs. Lena Pitcher had come from Eastern Oregon, and the “old folks” made it an occasion to invite their friends and relatives to their home to have an old fashioned time. Talent from Cottage Grove was engaged to furnish the music and from early in the evening until late at night everyone present was busy enjoying themselves. 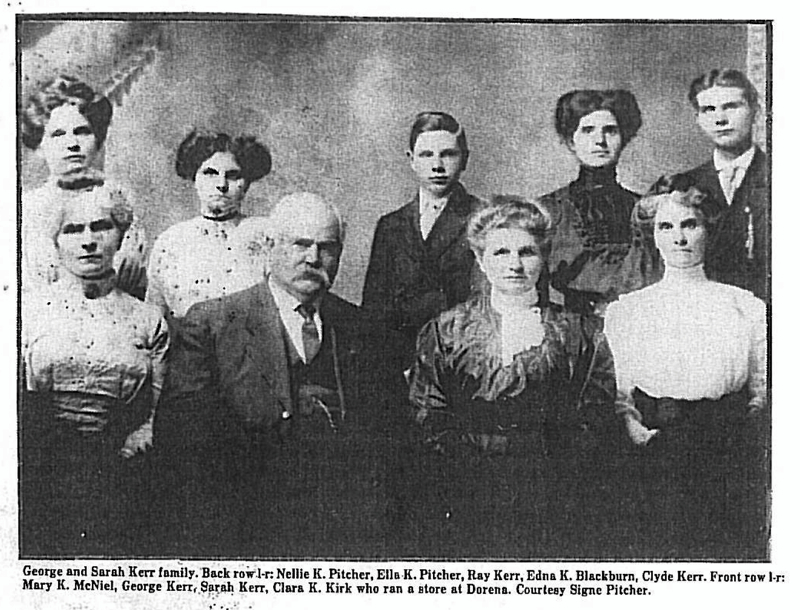 Mrs. Kerr facetiously remarked that “there never is a shortage of Pitchers in the family,” as the daughter, Lena, married Alva Pitcher, Ella married Ben Pitcher and Nellie married Green Pitcher. The Kerr homestead was often referred to as the Wildwood Hotel. It functioned as a sort of Bed and Breakfast for travelers to and from the mines. The Kerrs lived about a mile or so up the road from Wildwood Falls. Nothing remains of the old home/hotel.